I’ve spent time learning how to cook with fire – it’s not like switching on the induction hob, waiting for a timer to beep when it’s finished. You become a manager of heat, equating distance over temperature over time. It unifies your senses so that recipes become entangled with ideas, not to mention wind and rain; elements you need to balance against timber and charcoal. Through all this you learn more about the food, about the ingredients, and you bring them to life through careful tending. You become a gastronomic pyrotechnic. I’ve made a simple spit from a section of the old metal estate railing I found by a stack of sawn timber. It consists of two uprights and a cross section that sits over the fire. I can adjust the height and rotate what I’m cooking. This is a basic contraption, easily replicated by anyone with access to some metal rod, sturdy wire and a little ingenuity. Roasting food outdoors under the cold, dark sky, with hot embers and smoke, is feelgood cooking at its finest. This isn’t so much a recipe as a series of guidelines. The fun is in the experience – you’ll find your own methods as you progress. Choose a suitable spot for your fire and construct your spit. Put everything in position before you start your fire, ensuring you have plenty of dry kindling and logs to hand. Once everything is in place, get your fire going. It wants to get nice and hot with a good bed of embers beneath the flames and immediately below where your lamb will roast. Make sure the main rod is clean, then thread it through the leg under the shank, through and out the top of the leg, as close to the bone as possible. Use some thin wire to fix the leg securely in position, adding in some fresh rosemary sticks as you do so. Stud the lamb leg with peeled pieces of garlic and season all over with plenty of salt and pepper and a trickle of olive oil. Set the lamb over the fire, no more than a foot above any flames – you certainly shouldn’t be able to hold your hand below the lamb for any length of time. Cook steadily and consistently over a good hot fire, turning periodically, raising or dropping the level depending on the heat from below. Keep feeding the fire and watching. 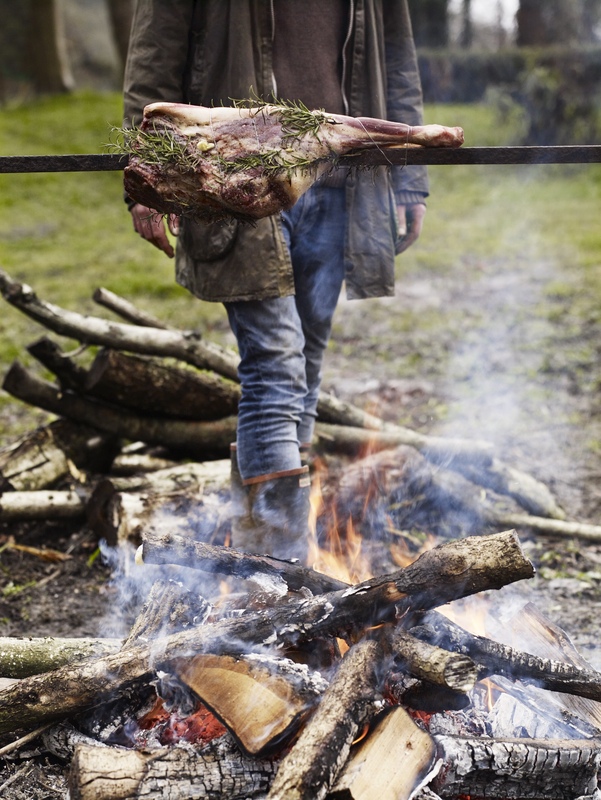 Be on hand to make small adjustments to both lamb and fire. The lamb leg will take several hours to cook. I’m being specifically unspecific and rightly so. There are too many variables involved to suggest cooking times. To get a good idea of how you’re getting on, pierce the lamb every so often with a skewer or small knife through to the centre of the meat. Leave it there for 30 seconds then take it out and touch it to your wrist for an instant. If it stings your flesh in that instant, you’re on the right track. The lamb should be piping hot throughout before you take it off to rest. Serve with potaoes cooked in the embers, roast onions and a green salad.